At 65 ‘As We May Think’ has reached its pensionable age but as yet is showing no signs of retiring. As a researcher within the Web Science and Hypertext domains, and as a member of SIGWEB, I already know who Vannevar Bush is and understand the importance of his work to my field. I know that he proposed the MEMEX, an analogue information system using microfilm which is seen as the distant forerunner to our current hypertext systems, and indeed, the World Wide Web. Luminaries such as Theodor Holm Nelson and Doug Engelbart have credited Bush as being the inspiration for their own work in hypertext and distributed systems such as the Web. So what more can we say about Vannevar Bush and the work which spurred the creation of the Hypertext field. It seems to me that Bush’s main ideas have never been more important than they are today. Indeed, the idea of association and its importance for the automation and augmentation of human thought and cognition still has resonance even today. Indeed, these concepts and the solutions they imply have become even more important than when they where first conceived, and throughout the 50s and 60s. It’s 65 years since Vannevar Bush’s visionary paper ‘As We May Think’ was first published in the Atlantic Review; spawning a new field of study and enthusing a generation of computer scientists, writers, and artists. The enthusiasm for the work continues today within many hypertext and hypermedia communities and we are seeing a resurgence of the hypertext ethos in the Web 2.0. Some may think that the ideas and concepts postulated in ‘As We May Think’ are old, tarnished, or without much value. But, it seems to me that the idea of association and its value for augmenting human understanding and cognition continues even today. So what of the man, what of the paper, and why does this work still continue to resonate 65 years after it was first published? 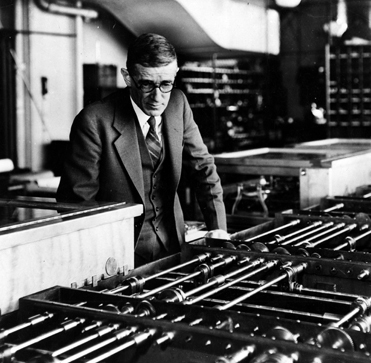 I’m looking at a picture of a bespectacled 35-year-old archetypal academic surveying the room of rods, gears, pulleys and rotors, all mechanically interconnected together; this is Vannevar Bush surveying his Differential Analyser. 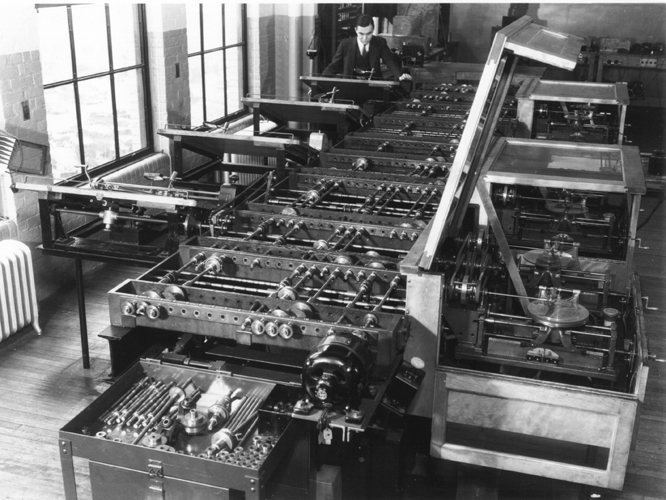 Bush constructed a differential analyser in 1927 while at MIT; it was an analog computer that could solve differential equations with as many as 18 independent variables. The analyser was a mechanical device which solved differential equations by integration, using wheel-and-disc mechanisms to perform the integration. It was one of the first advanced computing devices to be used operationally. It seems to me that this intimate understanding of solid physical networks, force supplied at one point generating changes and unintended consequences at another, and of physical models of abstract mathematics, defines the way that Bush thought. These real-world connections in the form of the differential analyser suggest to me that Bush understood very well the complexities and associations that are manifest in the real world. Bush’s development of the analyser and his refusal to move to digital technologies, even when those digital technologies were being developed at the same institution and at the same time, suggests that his mindset was very much concerned with quantifiable physical linkage and change. It seems obvious to me that he proposed in MEMEX, a system which also relied on the physical analogue, as opposed to upcoming digital technology. This idea, first proposed by Vannevar Bush in his 1945 Atlantic Monthly article ‘As We May Think’, is credited with being the inspiration, and precursor, for the modern World Wide Web. But for most of his article, Bush was not concerned solely with the technical aspects of his MEMEX system. Instead, as with most computer visionaries, he was more concerned with how the computer system and its interfaces could help humanity. He wanted us to understand that instead of fitting into the way a computer interacts and presents its data, the human cognitive and interactive processes should be paramount. In short, the computer should adapt itself to accommodate human needs; not the reverse. The key point here is the idea that human understanding and cognition can be enhanced by tailoring information, and the associations between this information, to the way that the human brain is organised; as opposed to rigid hierarchical structures which are often arbitrary and built using abstractions such as numbers or characters. Bush realise that linking information by association has far more in common with the human brain than do homogeneous hierarchies. In reality, we move between pieces of information not based upon any abstract property of that information but by properties of how we experienced it. Bush realised that if we could continue these associations through complex information we may very well understand it far more easily and in fare more detail. We see now that the Web provide us with massive amounts of information, but this information is difficult to get a grasp on. In this case we revert back to standard abstract types, ordering it into hierarchical structures such as Websites, alphabetised lists, lists based on date and time, or lists of search terms or tags. We can see that there is good reason for this especially when designing for a population, as opposed to an individual, however this misses the key point of association. It seems to me that in the personalisation and adaptive hypermedia domain there is far more scope to personalise the experience of the information we gather as opposed to the use of purely static structures, or those of the Web 2.0 and Ajax; which are often event related. In ‘As We May Think’, Vannevar Bush showed us a vision of how information could be manageable even on a large scale by association based on the experience of the individual. And further that this association would enable individuals to better comprehend information and thereby enhance our intellect and enable us to better investigate the world around us. Bush is quoted as saying that, ‘Science has a simple faith, which transcends utility. It is the faith that it is the privilege of man to learn to understand, and that this is his mission.’ Personal associations derived from experience, and not abstract structures, enables us to learn better and understand better, in this way Bush’s faith in science and humanities mission can be better accomplished. BUSH, V. 1996. As we may think. interactions 3, 2, 35–46. LEVY, D. M. 2005. To grow in wisdom: vannevar bush, information overload, and the life of leisure. In JCDL ’05: Proceedings of the 5th ACM/IEEE-CS joint conference on Digital libraries. ACM, New York, NY, USA,281–286. OINAS-KUKKONEN, H. 2007. From bush to engelbart: ’slowly, some little bells were ringing’. IEEE Ann. Hist.Comput. 29, 2, 31–39. OWENS, L. 1991. Vannevar bush and the differential analyzer: the text and context of an early computer. 3–38. SIMPSON, R., RENEAR, A., MYLONAS, E., AND VAN DAM, A. 1996. 50 years after “as we may think”: the brown/mit vannevar bush symposium. interactions 3, 2, 47–67. WALDROP, M. M. 2001. The dream machine: J. C. R. Licklider and the revolution that made computing personal. Viking, New York. ZACHARY, G. P. 1997. Endless frontier: Vannevar Bush, engineer of the American Century. Free Press, New York.